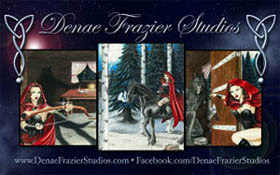 « HAPPY NEW YEAR FROM DENAE FRAZIER STUDIOS! Our first show for 2015 will be Amazing Arizona Comic Con Feb. 13-15th, 2015 at the Phoenix Convention Center. Yay!! We will be in Artist Alley at Table B11 and B12! This entry was posted in appearances, art, events, news and tagged Amazing Arizona Comic Con, JayCompany Comics, Phoenix Convention Center. Bookmark the permalink. Post a comment or leave a trackback: Trackback URL.